Some friends came over for dinner one night not too long ago, and I arrived home from work only 20 minutes prior to their arrival. In that 20 minutes, I set the table, put out cheese and olives, made a quick salad of baby greens and a simple vinaigrette, put some fingerling potatoes on to boil, and dredged three veal escalopes in flour. After my friends arrived I prepared the veal marsala. It is so easy. It would be good with chicken too if you can find escalopes or if you want to make them yourself by pounding out chicken breasts. Melt 2T butter in a large pan over medium heat. Add sliced mushrooms and cook about 10 minutes until the mushrooms begin to brown. Remove mushrooms from pan and set aside. Rinse and pat dry the veal. Dredge the veal in the flour. Melt the other 2T of butter over medium heat. Place the veal in the pan and cook until browned on each side. It shouldn't take much longer than a couple of minutes per side if the pieces are thin. Remove the veal to a dish. Add the marsala to deglaze the pan and turn up the heat. Reduce the wine for a couple of minutes. Add the mushrooms to the pan and warm. Pour over the veal, sprinkle with parsley and serve. I really liked the fingerling potatoes with this dish. I boiled them and then stirred in some butter, roasted garlic and chopped parsley. Last nights some girlfriends and I were the dinner guests of Bryon Zupon, the Duke undergraduate who has earned a reputation of late as an inventive and talented chef. His unconventional set up and techniques have been lauded on NPR and the New York Times Magazine. We had a wonderful meal! All of us love food and it was a treat to experience the surprising and creative combinations of flavors. Bryan executes flawlessly. He presents the food beautifully with an attention to detail. I especially liked when he pulled out an eye dropper to place small, graduated dots of concord grape syrup on the plates with our fish. I have an eye dropper in the medicine cabinet but it really hadn't occurred to me to keep on in the kitchen! For such a young person, Bryan is a confident and gracious host. He is way cooler than I or any of my friends were in college! We were glad to spend time with a young man who is talented and very clearly passionate about food. He approaches food with imagination and curiosity that leads to surprising pairings like chocolate and sesame powder or miso and butterscotch. His talent lies not only in his imaginative dishes but, perhaps more importantly, in creating dishes that are a perfect and very precise harmony of flavors. That's hard to do, especially when the flavors are as seemingly dissonant as miso and butterscotch. Bryan has had some critics in the Durham food circle. Personally, I find that mean-spirited and probably motivated by jealousy and cynicism. I don't get that approach (and don't bother posting a comment to explain it to me because I'm not interested). My friends and I unanimously agreed that the soup and the bacon wrapped buns were our favorite. The cream soup was made of Jerusalem artichokes (aka sunchokes) and garnishes of wild mushroom were shitake and hen of the woods. 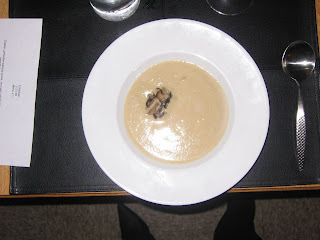 The soup with silky smooth with the mellow earthiness of the mushrooms. We all wanted to lick the bowls. Bryan admits that this dish is not particularly inventive but it is so GOOD that who cares! It was probably the best soup I've eaten. The bacon buns were made of pork belly cooked sous vide for 24 hours at 160 degrees Fahrenheit. 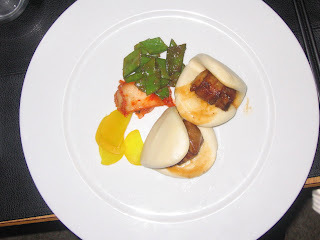 Pieces of pork belly were then wrapped in bacon and put in soft, doughy Chinese styles buns and served with miso butterscotch sauce. They were perfect. I could have eaten twenty of them. Bacon wrapped in bacon. Hello? What's not to adore about that? I'm so glad I'm not a vegetarian! The dessert also deserves a mention. 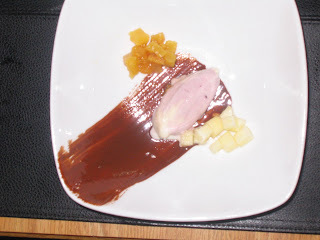 The tart, crisp apples, the sweet, soft roasted pineapple and the chocolate with a faint whiff of sesame were very strange but delicious combinations with the goat milk ice cream. It was bold and exciting. We agreed that the meal was the best any of us have had in a long while. 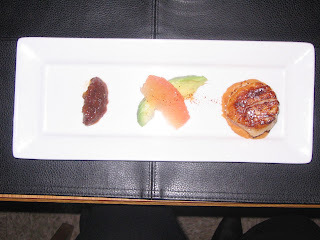 We paired each course with wines recommended by Seth and Craig at the Wine Authorities. I was especially pleased with a very lovely white Burgundy and a cabernet franc, also French. Those two guys are geniuses at wine pairings. Toast Paninoteca is a new place on Main Street that opened a few weeks ago. I headed over there for lunch to try it out. As the name suggests, the restaurant features paninis and other wonderful concoctions on bread. The paninis are hot, grilled sandwiches, the tramezzini are cold sandwiches, the bruschetta and crostini are grilled and toasted respectively and topped with various things. With bread as the main ingredient, high quality bread is essential. Toast's bread comes from the Rue Cler bakery and Guglhupf, so it doesn't get much better than that in Durham. Plus they are supporting local Durham businesses. I am partial to any bread that is hot and contains melted cheese so Toast makes me very happy. I intend to try all of the panini. For my lunch I had a panini with rapini, Italian sausage and cheese, I think asiago but I cannot quite recall. The rapini, aka broccoli rabe (though it has no relation to broccoli), was seasoned with roasted garlic and a hint of red pepper flake. It reminded me of a pasta recipe from the Puglia region of Italy that I like to make. In the next week or so, Toast will be getting it's liquor license to serve beer and wine. I am looking forward to going after work with my girlfriends for a glass of wine and some roasted mushroom, thyme and gorgonzola crostini and maybe some bacalao crostini. A few years ago I considered becoming a vegetarian. Obviously I decided against it. I like meat, fish and fowl (except turkey), especially bacon, steak and pâté. At one point I wanted to be a butcher but that is another story. I decided that I could only eat meat in good faith if I was willing to kill it, clean it and fix it myself. I do not really have the option for regularly fishing or hunting or even raising (can't keep a cow in the city limits) my own meat, but theoretically I am mentally and emotionally capable of doing this should the occasion arise. Anyone who does not have the stomach for killing another creature to eat it should be a vegetarian. It's not right to be capable of eating meat only if it comes in the sanitized form of neat little cuts in tidy plastic containers, is it? Reading Michael Pollan's Omnivore's Dilemma pushed me over the edge. I signed up for a hunting education and safety class. My goal is to go pheasant, quail and/or duck hunting. I only want to hunt what I will eat so no turkey or deer hunting. I'm not a huge fan of venison, and I don't really want to deal with an animal that I cannot carry out of the woods. My general rule of thumb: if it is big enough to trample on me then don't aggravate it by shooting at it. There are two exceptions: I would love to hunt boar and alligator. Boar are apparently mean and scary. I just want one to eat not for trophy. YUM. Boar is tasty! Same with alligator. They have big teeth but they sure taste good stewed or on the grill, and they make lovely handbags! In all likelihood, most creatures will be safe. I'm not a very good shot. Recently Gourmet magazine featured a story about Durham's taquerias. La Vaquita on Chapel Hill Street is mentioned in the article. It's a tiny take out place with a large cow standing on the roof (not a real cow), hence the name La Vaquita. The place used to be a dairy but that was well before my time in Durham. Nowadays it is a great taqueria run by a guy from Veracruz, Mexico. I've been a few times. The food is fresh and delicious. I've tried almost every variety of meat fillings for the tacos, sincronizada (basically a quesadilla), and huaraches (thick, corn tortilla). My favorite is the carne asada which is simply grilled beef. My next favorite is the barbacoa which is beef in a mildly spicy sauce. My third favorite is the ground chorizo sausage. But then the carnitas is great too...OK I like it all. Don't make me choose a favorite! The tacos are served on a soft corn tortilla with a wedge of lime and some radishes. I adore the sincronizada with carne asada. It is served with lettuce, tomato, crema (kind of like sour cream) and cheese. One day I will branch out and try the shrimp with garlic and maybe the mole. The food takes awhile to appear because everything is freshly made, so don't go if you expect fast food. The place is located between my gym and my house. If I have a good work out, I treat myself! Weekend brunch at Rue Cler features not only great, strong coffee and the possibility of beignets for a starter but also savory crepes, steak frites, and their version of eggs Benedict. I've been to Rue Cler several times for dinner but I only tried out their brunch last week with a friend. I love the space. It's small and a little noisy, but that gives it a warm, lively feel. I resisted having fried dough as a starter, but if you are in need of a sugar and fat fix order the beignets. The coffee is dark and strong and perfect with some cream. It's strong enough to make a mule run backwards, so if that is not how you like your coffee, then you might order hot tea instead. I order a crepe filled with Boursin cheese and roasted bell peppers. It was served with a side salad. The dish was delicate and subtle but substantial enough to fill me up. My friend ate ever morsel of the eggs Benedict, so it must've been good although I didn't taste it. If you are looking for a place to go with a dash of elegance for brunch, then head to Rue Cler. If you are looking for a hearty meal of eggs, bacon, grits and biscuits then head to Elmo's or Honey's. I got my cooking mojo back this weekend after a bit of rest and relaxation. I cooked dinner on Saturday for a friend before we went to the ballet. Last year she and I fixed lobster together in what turned out to be quite an adventure involving garden tools. I was determined not to let any of our pricey crustaceans go to waste so I took the carcases home to join some crab leg shells and shrimp shells in a pot for some homemade seafood stock. It has been sitting in my freezer for ages. I decided seafood risotto was the perfect dish for it. The risotto turned out great! Excellent stock really is the ticket for fantastic risotto. And seafood stock is a real treat! Next time you fix crab or shrimp at home, save the shells and make a stock. Warm the stock over low heat in a saucepan, sprinkle a pinch of saffron into the stock and stir. Don't overdo the saffron. It should be enough just to suggest saffron and not to overpower the seafood. Melt the 2 T butter over medium heat in another saucepan or dutch oven. Add shallots and cook until softened about 3 minutes. Add the rice and stir until it is coated in butter. Add the wine and let it cook off. Slowly add the stock one or two cups at a time allowing the liquid to absorb before adding more. Stir often. It should take about 30 to 40 minutes to add the stock. The aborio should be tender and the consistency creamy. After adding the last cup of stock, add the shrimp or other seafood. Cook for another 3 minutes or until the shrimp is pink and the scallops are done. Sprinkle with fresh grated Parmesan cheese. Season with salt and pepper to taste. I don't know what I've been doing but I'm too tired, busy, and lazy to cook this week. I've been eating peanut butter sandwiches for dinner alternating between my homemade strawberry jam that I made last May and locally made honey from some guy out in the county. When I really want to mix it up, I'll make a grilled cheese sandwich. At least I've not succumbed yet to eating cereal for dinner. Though I confess it has to be done some nights. This weekend I am going to make French onion soup and maybe one night grill some steak to eat with sauteed rapini. Valentine's Day is kind of silly and if you don't have someone it can be downright annoying. Have you ever wanted to wear black and drive over a tacky box of cheap chocolates in protest? All I have to say is GO FOR IT, if that is where you are at. If you do feel inclined to cook something special for a friend or loved one, then I suggest some of my favorite special occasion recipes that are surprisingly easy. Go to Wine Authorities and ask Craig or Seth to suggest wine pairings according to your taste and budget. If you are male, you might consider some lovely flower other than red roses: orchids, birds of paradise, and lilies are nice options. You might choose a color to coordinate with her living room or bedroom colors. Also, do not hand a lady a bunch of flowers wrapped in plastic. Remove the plastic, dry the stems, and tie a ribbon around them (wrap ribbon around the bunch several times then tie into a bow...if you can tie shoes, you can do this). The florist should be able to give you some ribbon. Don't forget to tell your sweetie that you are the luckiest man alive. Some friends and I went to dinner on Friday night at the Lantern in Chapel Hill. Parking in Chapel Hill is a stressful endeavor and not a great way to start the evening. However, once we finally got settled at our table, we had a wonderful evening. The atmosphere is great: modern, attractive and flattering lighting, a giant vase of forsythia stems in bloom. Our server was attentive but not fawning. He gave us excellent recommendations on the food and wine. For starters, we shared some pork and chive dumplings. They were delicious. Sometimes dumplings taste like mystery meat and mystery seasoning, but these definitely has the taste of pork and chives. The waiter told us that the pork and crab dumplings are also delicious so I am looking forward to trying those someday soon. For the main course, I had a pork shank braised in coconut milk with galangal. The meat was falling off the bone tender. The coconut milk was rich but not sweet. A papaya side dish was refreshing and a nice contrast to the rich, heavy pork. One friend ordered the whole fried flounder. It was spicy and seasoned with garlic and chilis. She ate every last morsel (except the tail fin and the eyeball). The fish was tender and perfectly cooked. My other friend ordered chicken smoked in tea served in a cognac sauce. The tea gave the smoked chicken a unique flavor. I liked it very much. While every dish was delicious, I could not get enough of the tea smoked chicken. I will order it next time. 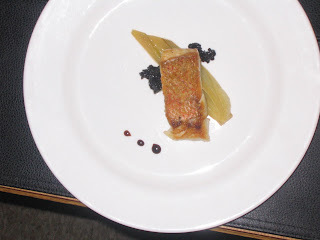 A regular feature of the Lantern's dinner menu is the black cod. I usually order that but I am glad I branched out during this visit. The desserts looked fabulous but we were too stuffed. Instead we ordered tea. After dinner we retired to the bar behind the dining room. It's a cool space: dimly lit with black and red decor. I highly recommend the Lantern for a great night out.